Sixdogs.gr has definitely been the project of the year for our small yet ambitious firm. After last December's Awwwards special mention, another distinction came - this time on a national level. We proudly received a merit at the EBGE 2014 awards, in the ultra-competitive "Product & Corporate Website" category. 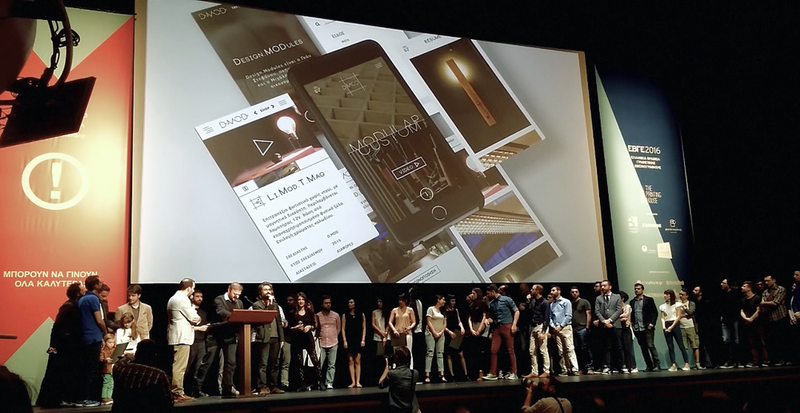 We stood onstage with our long-time developer Dimitris Marlagkoutsos (aka Sirtimid) to thank all the contributors, the actual Six D.O.G.S team included. We didn't have much time to check if the Onassis Cultural Center main hall's huge screen was playing the video we had prepared for the ceremony. So, for the ones who'd rather let us guide them through this website, here it is, full with music that Six D.O.G.S hosts all the time. Enjoy! Big thanks to Yiorgos Kaagiorgos for creating the video.